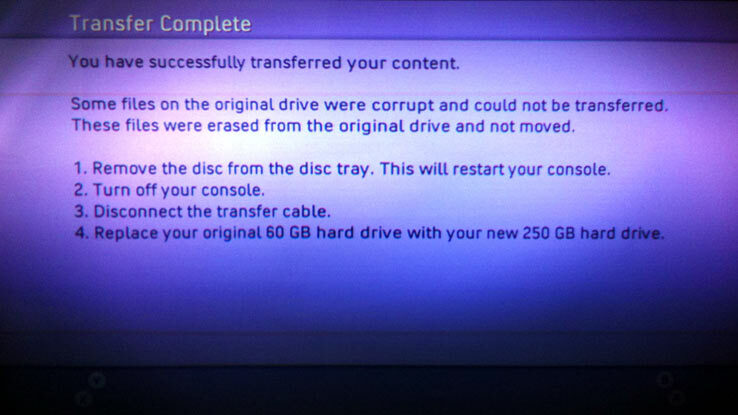 Since there seems to be a dearth of conclusive information (and a lot of repetitive questions) about the Xbox 360 Hard Drive Transfer Kit, I thought I’d document the process of using mine in case anybody is wondering how the thing works. I’m using it to transfer the contents of my 60 GB hard drive to the 250 GB hard drive that came with my new Final Fantasy XIII special edition Xbox 360. 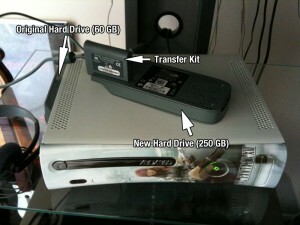 First and foremost, some basic Q and A.
Q: Where do I get the Xbox 360 Hard Drive Transfer Kit? A: If you’re in the U.S. or Canada, you can order it from the Microsoft Online Store. 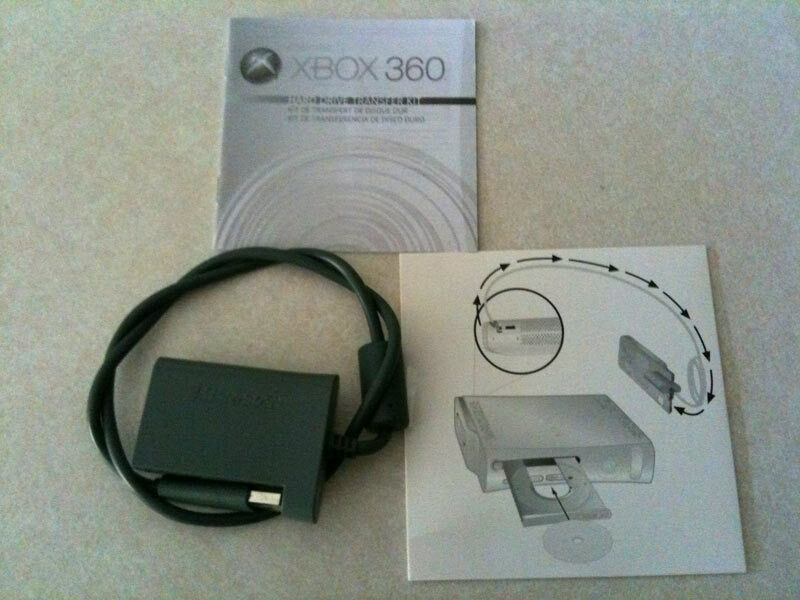 It also comes packaged in the new standalone 250 GB Xbox 360 hard drive that’s going on sale this week. Q: Can I use the Transfer Kit on a drive whose contents were transferred once before? A: Yeah. The stuff that’s currently on my 60 GB drive was originally on my launch-day 20 GB drive. A few months ago I had the transfer performed at a local game shop that had a Transfer Kit available for use. Today I used my own Transfer Kit to migrate the same stuff onto a new 250 GB drive. The central limiting factor is that the target drive must be the same size, or larger, than your source drive. For instance, you can transfer from a 120 GB to a 250 GB, or a 120 GB to another 120 GB, but you can’t go from a 120 GB to a 60 GB (even if you have less than 60 GB worth of stuff on your source drive). Q: Can the Transfer Kit be used more than once? I hear it self-destructs after you use it! A: It’s possible that the original revision of the Transfer Kit — the one that only worked on 20 GB source drives and 120 GB target drives — self-destructed after one use. I’ve heard some stories to that effect, though I don’t know for certain. I do know, however, that the newer model Transfer Kits can be used multiple times. The fact that a local game store offers the use of their lone in-house kit for customer transfers should be evidence enough. 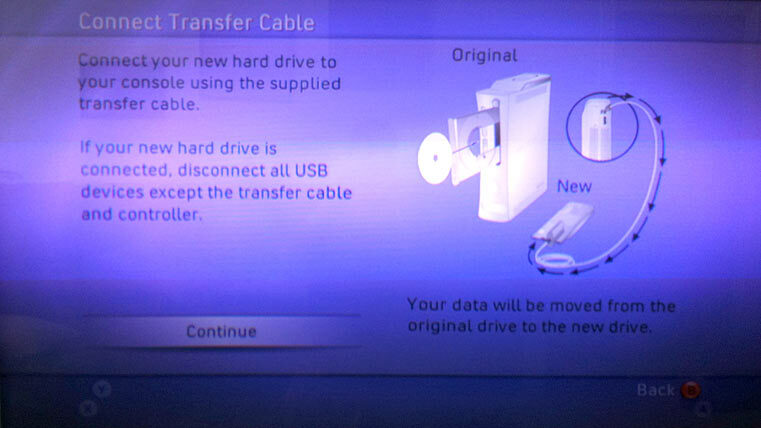 Take note, however, that the contents of your source drive will be erased after the transfer is complete, so no more than one “copy” of your source drive’s contents may ever exist at a time. 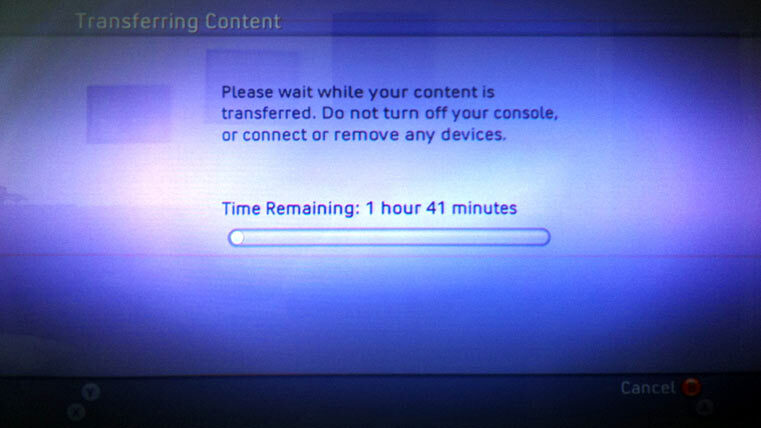 Q: How long does the transfer take? A: It depends on how much stuff you have on your hard drive. 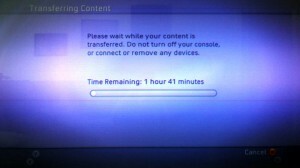 I had about 25 GB worth of stuff on mine, and it took about an hour and forty minutes to complete the transfer. Q: How do I know which revision of the Transfer Kit I have? There are two revisions of the Transfer Kit hardware. The original has part number X812003-001 on the cable’s large end and only supports transfers from 20 GB hard drives to 120 GB hard drives. The second revision, which is also the most recent as of this writing, bears part number X815251-002 and supports all Xbox hard drive sizes up through and including the 250 GB. For more details, including part numbers for the included software CD, check out this forum post on CheapAssGamer.com. Okay, with that out of the way, here’s the pictorial. As usual, click on any picture to embiggen. Here’s what should come with the Transfer Kit: The transfer cable hardware itself, a software disc, and an instruction booklet. Connect your old (source) hard drive to your console as normal, using the drive bay at the top end. 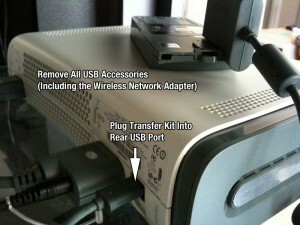 Connect the Transfer Kit cable to your new (target) hard drive as shown. It can only go on one way, so if it doesn’t seem to want to fit, don’t force it. Now insert the software disc that came with the Transfer Kit and launch it from the dashboard if necessary. The first thing you’ll see is this screen describing the process and telling you that if there’s anything you want to delete from your source drive before you get started, to quit the transfer software and do so now. Deleting large stuff that you can easily add back later — most notably installed disc-based games, which can take up 6 or 7 GB apiece — can be a good idea, since leaving them on the drive will just make the transfer take longer. If you’re ready, select “Continue” to proceed. This screen describes the connections and tells you how to get the Transfer Kit set up. If you followed the instructions in the booklet, then you already did all this before you got here. Select “Continue” to proceed. 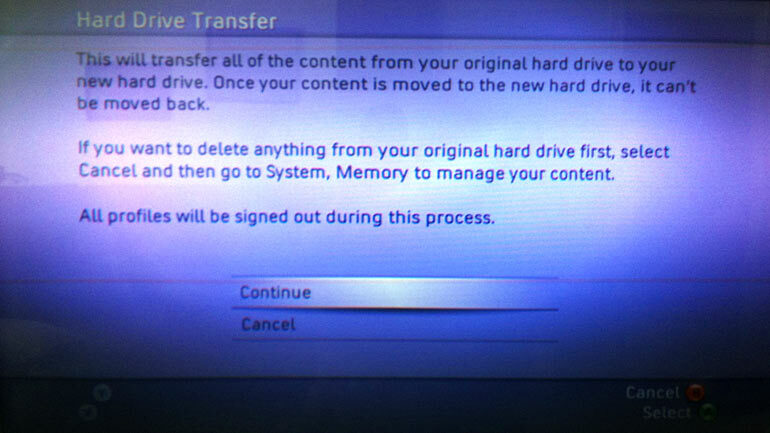 This final confirmation screen warns that all content on your target drive will be erased, so if there’s anything on the new drive you’re moving your stuff to, kiss it goodbye. This screen also gives you an estimated time to completion, in my case one hour and 40 minutes. Select “Transfer Content” to start the migration process! Oh wait, did you get all excited and think that was actually gonna really for-real start the transfer? My apologies. In traditional style, Microsoft pops open a dialog to tell you the same thing they just told you if you had bothered to read: That all content on your new hard drive will be erased. Select “Format and Transfer” to really start the migration process. The transfer begins. A progress bar and countdown keep track of how far along you are. Since this is likely to take at least an hour in the majority of cases, feel free to go grab a sandwich, watch an episode of Star Trek: The Next Generation or actually go back to work. Come back later and (if nothing went horribly wrong) you’ll find that your transfer is complete. In my case, as you can see, the software is warning that some of the files on my original drive were “corrupt” and could not be transferred; they were deleted instead. This would just about give any rational user a heart attack, but I believe that this is actually fairly common. Most of the time, I think the corrupt files are things that you already deleted yourself and which you weren’t expecting to be there anyway. In fact, not only did I not see anything missing while casually browsing my new drive, but I also saw a whole bunch of demos that I deleted long, long ago. Most likely, these are among the “corrupt” files that were mentioned; the transfer software appears to try to recover deleted files that may not have been properly marked as such. In their review of the initial-revision Transfer Kit, IGN reported the same results, so I wouldn’t worry about it. Now, all you have to do is take out the transfer software CD, shut down your console and swap hard drives. Remove your original hard drive (which is now blank, remember) and stow it, sell it, take it apart or do whatever else you want with it. 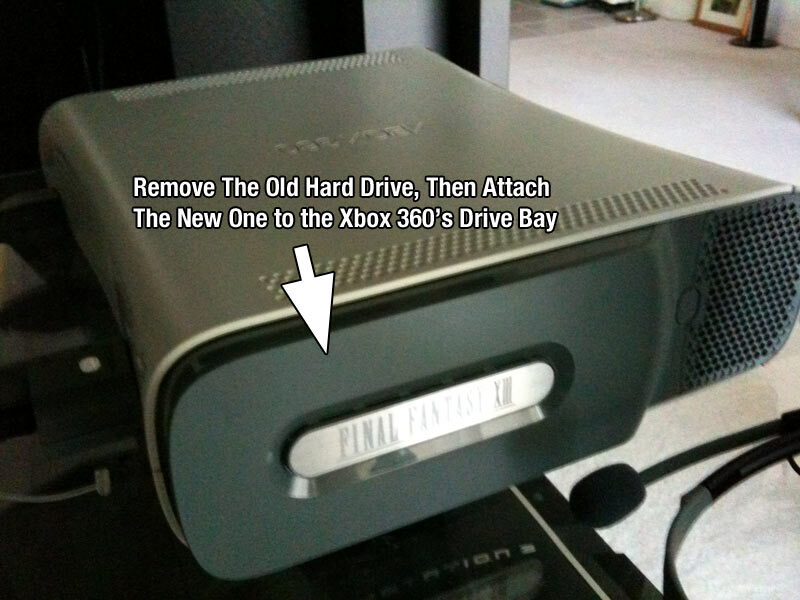 Then, install your new hard drive in its place, using the Xbox 360’s top end drive bay. Don’t forget to reattach your USB accessories, including your wireless network adapter (if any). 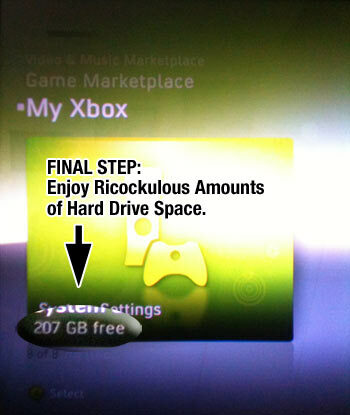 Now boot up your console and enjoy all of your newfound hard drive space. Approximately 6 GB will be “reserved” by the Xbox’s operating system, in case the amount of free space isn’t what you expected. That concludes the Oddball Update pictorial illustrating the use of the Xbox 360 Hard Drive Transfer Kit. If you have any questions, post ’em below. Oddball Update embodies the random thoughts of a user interface designer, video gamer, muscle car fanatic and newly-minted dad. This blog is home to rants and commentary, reviews of video games, books and other media, and musings on life. Relevance is not guaranteed.